It sounds like almost everyone is have just insanely awesome weather right now. It was another 80-degree day here again. Sunny, warm, but really windy. I guess that's spring for you. I am loving all the new blooms of color right now. Just so refreshing - other than the pollen that is. We are already having pollen alert days if you can believe that. But I'll certainly take a greenish/yellow car if that means warmer days and vibrant colors. I have decided to follow a 10K training plan from Smart Coach. I chose a moderate plan with low miles. It's not necessarily so I can race. It's merely a tool I am going to use to ease back into running. So no 6.5 mile runs right now. Nope, easy 2 milers or short tempo runs is all this plan has for me slowly building towards 5 miles tops. And I think that's what I need to scale back and start fresh. Who knows, maybe it'll help me rebuild my speed and endurance much better than before. If nothing else, at least I am outside. Today Jason and I did a pretty easy 2.19 mile run around the neighborhood. While my head wanted to keep going, my body was glad that we stopped earlier. I have decided that coming back from any injury or even illness means that everything feels doubled - so 2 miles feels like 4, 6.5 was 13, and 13.1, well, my poor body thought I was trying to force a marathon. So while the run wasn't pain free, it was mentally much better than Saturday's run. It was the kind of run I really needed. I worked hard, no doubt about it, but it felt good. And the sunshine and good company sure didn't hurt matters. The weather was just too nice not to take advantage of the grill again tonight. Jason stopped by a local market and picked up some asparagus, squash, and mushrooms. I had plenty of bell peppers on hand. I had intended on making some quinoa as a base for the veggies, but apparently am out. So I went with barley instead. I was debating on mixing everything together and adding in a vinaigrette, but decided to cook the barley in a bit of a leftover balsamic vinaigrette that I had used to marinate tofu in for yesterday's dinner. When the majority of the water had cooked out of the barley, I added in salt, pepper, garlic powder, parsley, and the vinaigrette and let it cook until the rest of the liquid was absorbed. It definitely made the barley much more flavorful. In the end, I tossed everything together in a single bowl and also included chickpeas. I add more seasonings to the veggies (same as for barley as we didn't season before grilling). 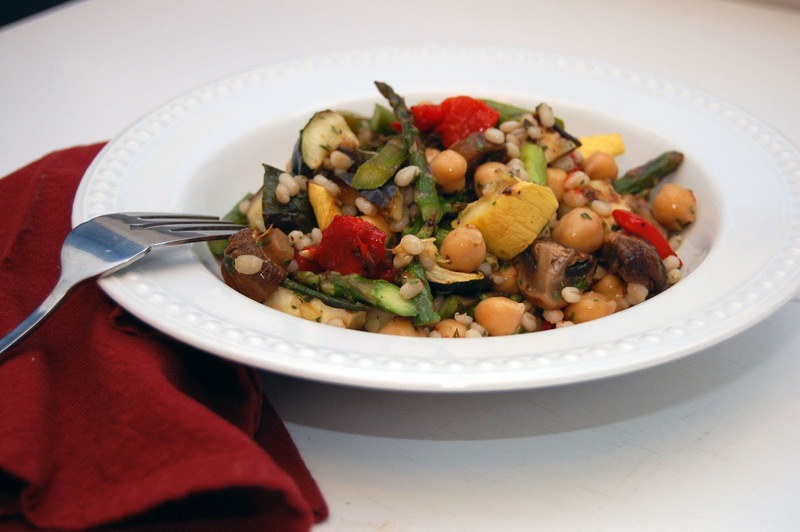 So, long rambling, non-recipe to say we made a grilled veggie and barley dinner. And...it was really pretty tasty I must say.